The Design Museum has two cool exhibitions on: Top 25 design icon’s over the past 25 years (apparently it’s the museum’s birthday) and Luigi Colani‘s Translating nature. 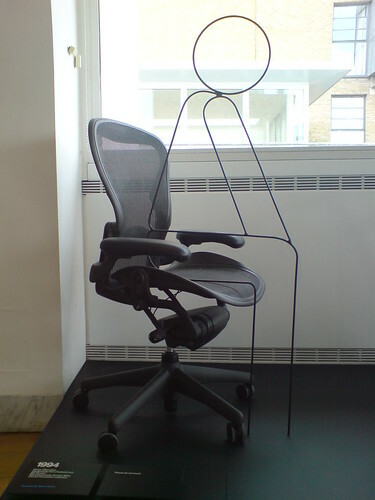 The unbeatable Aeron, the chair of choice for Skype offices (video proof) worldwide and with the ripple effect into the home offices for many of us (including yours’ truly) was apparently the Design Thing of 1994. Can’t believe that’s 13 years ago already, still does look fresh. 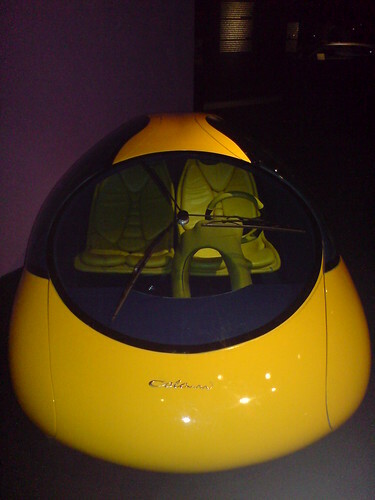 Sample of typical (if I may) Colani design. If nothing else you just gotta love those windscreen wipers. Did you know the guy also did the modern-day Canon SLR body? While in Estonia you get quite used to the orange-and-black Wifi stickers on doors and street signs everywhere, it is definitely not a standard globally. 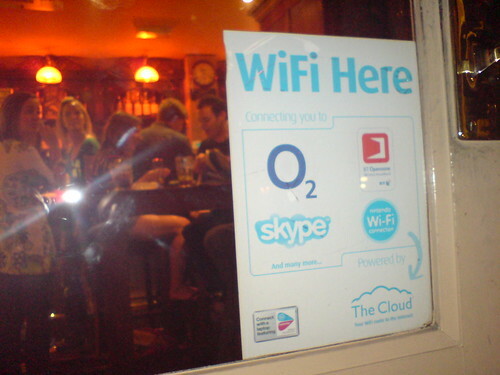 The merrier I was to find one featuring also the things you should do while connected (talk to people using Skype) on the door of Spreaded Eagle pub in Camden, London. 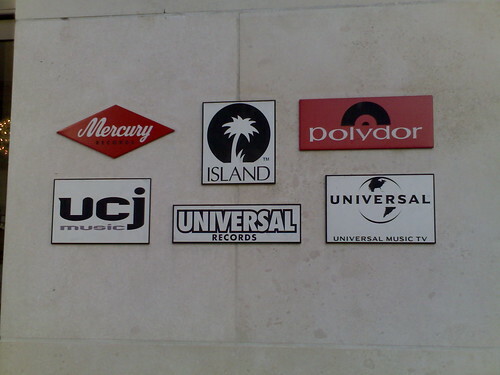 A display of logos I noticed passing the Universal building this morning on my way to work. The last time I ever saw some of these true classics (like Island & Polydor) was browsing my dad’s vinyl collection… maybe fifteen years ago, was it? I can understand it in the virtual world of music downloads, but I wonder why do the music industry logos on the CD-s you buy stick in the eye so much less than the (as I remember them to be) prominent ones on 12″ covers? Were they really bigger then? Or was holding a record just so much more special that you cared to notice the details? Or did/does vinyl as a medium dictate a much wider range of cool brands than those of the few mainstream global music powerhouses everything has consolidated into? 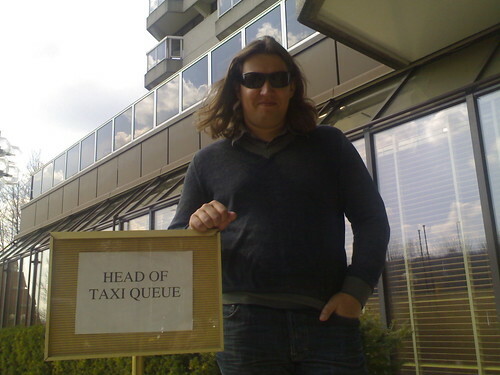 Ott found a new fancy job title to aim for in his future career. 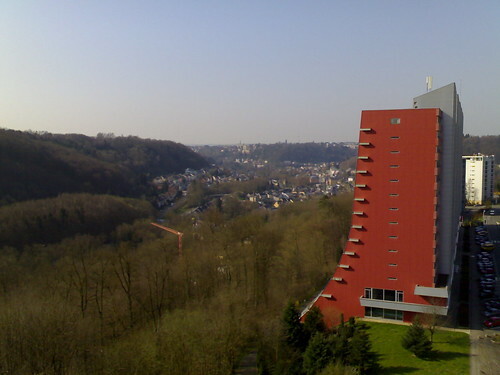 A glimpse of nice and sunny Luxembourg before shutdown for one and a half days into a meeting room. 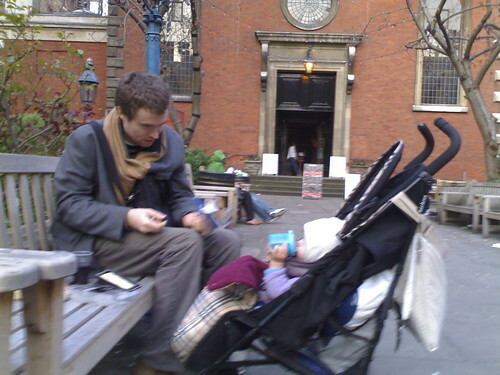 If you’re hanging around Covent Garden and don’t quite feel up for shopping it can be amazingly hard to find a place to sit down at that would offer a glass of wine AND be baby friendly (e.g. not loud and smoky). Those witty Eastern Europeans always find a DIY solution if a commercial one is not available. Kalm serving wine & cheese from Tesco’s, on a bench behind a nearby church this time.